PowerPoint: This provides all the data from the research. It is designed so that users can pull the slides that they need to create their own shorter version. NEW! 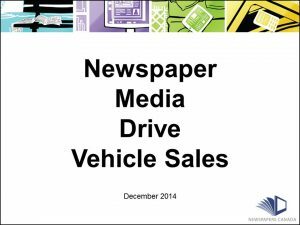 Newspaper Media Drive Vehicle Sales (Fact Sheet): This two-page summary shows that printed and digital newspapers are the strongest media at all stages of the buying process among Canadians who purchased a new vehicle in the past two years. 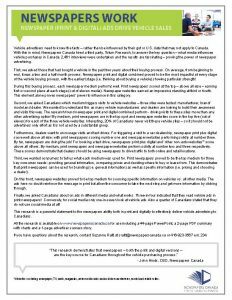 1-page PDF summary: (copy) This one-page written summary provides a quick overview of the impressive influence of newspaper media in the automotive category. The easy-to-read one page summary contains powerful information that can change where ads are placed. 2-page PDF summary: (charts) This two-page summary provides a quick overview of the key research findings and includes a variety of charts on the data. This PDF can be printed, emailed or key facts can be gleaned from it for use. 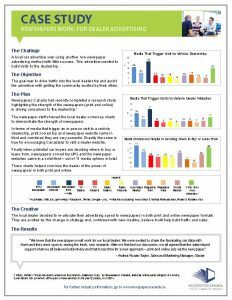 Vehicle case study: This 1-page PDF proves that newspaper media work by sharing an actual advertiser’s success story. 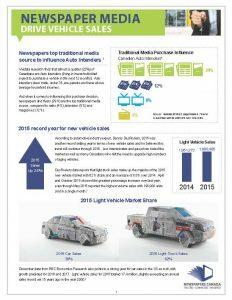 Infographic: Newspapers Drive Vehicle Sales This infographic is designed as a brief overview of the research for media planners, auto advertisers and dealers. 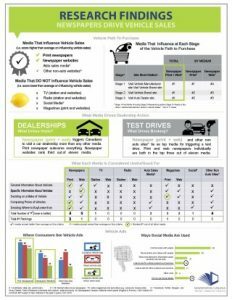 In one page, it visually highlights the power of newspapers (both print and online) in the automotive purchase process. 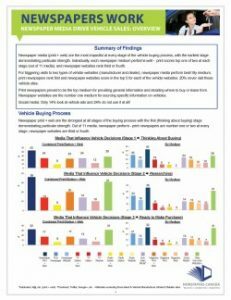 CASE STUDY - Newspapers Work: For Dealer Advertising This 1-page PDF proves that newspaper media works for automotive dealer advertising by sharing an actual newspaper's success story. More resources on the power of automotive advertising in newspapers can be found here. If you have questions about the research, contact Kelly Levson, Director of Marketing and Research, at klevson@newspaperscanada.ca or 416-923-3567 ext. 3401.